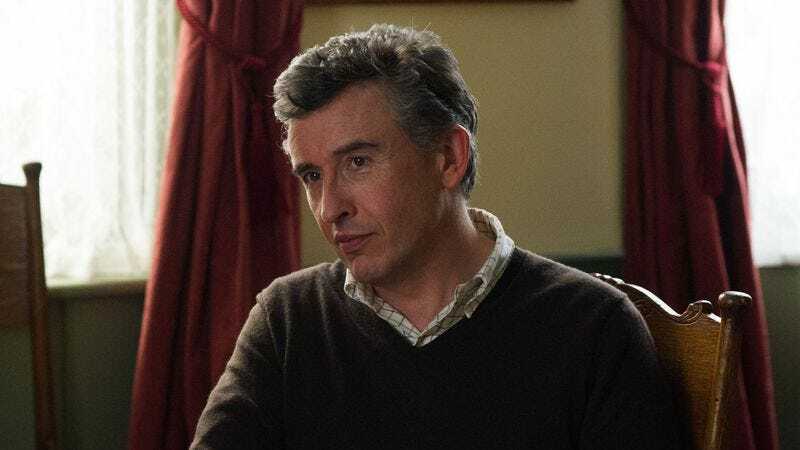 The hater: After veering toward the dramatic with the Oscar-nominated Philomena this past year, veteran British comedian-actor Steve Coogan steps back into his comfort zone with Alan Partridge, an absurd feature-length culmination of the character he first portrayed nearly 25 years ago on the groundbreaking BBC radio show On The Hour. The ambitious if inept Partridge has gone from local sports reporter to national television broadcaster and back again in a span of mediums that include radio, TV, and now film. It’s a crisis movie of sorts that tests how self-absorbed Partridge can remain in a hostage situation. The A.V. Club: What is it about “The Lady In Red” that makes you froth at the mouth? Steve Coogan: There are others, but for someone who grew up in the late ’70s listening to Siouxsie And The Banshees and a lot of post-punk like Joy Division and nihilistic industrial electronic music, this was everything that I sort of railed against. You know if it’s the sort of thing your grandmother would like, then it’s already holed below the waterline. It’s the sort of bland, moribund, and profoundly dull lift music. It’s what stupid people dance to at weddings. There’s no substance to it. It doesn’t stay with you. It’s like woodchip wallpaper. I’m not sure you have that in the U.S. It’s like magnolia paint in rented accommodations. The tune is turgid. It’s like someone going “la la la la la” in the shower. You don’t feel there’s a strong voice, and when I say voice, I don’t mean Chris De Burgh’s voice. I mean something that’s been lived. It’s like a soup from Walmart. I mean, I don’t like modern jazz. I like smoother jazz, but not so smooth that it veers toward Chris De Burgh. That would be wrong. I like trad jazz and New Orleans jazz, but modern jazz, when you know the musicians are having a better time than the people listening to the music, then I don’t like that. That’s self-indulgent. You’re like, “Okay, you can play, but I’m having trouble stomaching this kind of tune.” There’s this piece I liked recently, IBM 1401, A User’s Manual, by this Icelandic composer [Jóhann Jóhannsson]. He uses the sound of a mainframe computer system in the ’60s and then put orchestral strings on top of it. That I go, “Wow, this is making me think of things in a sort of different way.” I don’t listen to Chris De Burgh’s “Lady In Red” and think, “Boy, this makes me think about things in a different way.” It makes me think that he saw a woman who was dressed in red, and he thought she was pretty hot. That’s it, and then he marries her. Really? I don’t have anything personal against Chris De Burgh, but that kind of blandness to me is the enemy of creativity. AVC: There’s no tension in the song. Maybe if it were actually about alcoholism and the “lady” was a nice Bordeaux? SC: Yeah, or take “Lucy In The Sky With Diamonds.” I don’t particularly want to take LSD, but it makes me think that’s interesting because I’m getting a sense of some “otherness” there. If it’s accidentally on the radio and I don’t have time to change it, I just feel like that’s three minutes of my life I’m never going to get back again. SC: I’m banking on the DJ interrupting during the fadeout. AVC: According to Wikipedia, De Burgh’s main inspiration was a realization he had that men don’t remember what women are wearing when they meet them. Deep, huh? SC: And that’s it. That’s the subtext I guess: Guys don’t remember what chicks wear. AVC: He later had an affair with his kids’ 19-year-old babysitter while his wife was recovering from a horseback-riding accident. AVC: I don’t think anyone’s ever accused the song of having a cultural richness. If you had to choose, though, is it the music or the lyrics that are more culturally bankrupt? SC: It’s both. It’s like, “We’re dancing cheek to cheek.” I know there are people who might say, “What’s your problem? It’s a nice tune. People like it. They like to dance to it at their weddings. What’s your problem, you style fascist?” Maybe, but on balance, I’d rather stick to my point of view. It might be elitist of me, but that’s the price I’m willing to pay. AVC: Have you been forced at any time in your life to dance to that song at a wedding? SC: I don’t know. In my imagination, I think I’ve been to weddings where I’ve seen people dance to that at the end. It’s like when everyone used to want that Bryan Adams song “(Everything I Do) I Do It For You” when they walked up the aisle. AVC: Was that a contender when you were picking a song? SC: It was, but I don’t think it’s as bad. The problem with it is that it’s shrink-wrapped rock. It’s like rock music off the shelf with preservatives and wrapped in cellophane that you can keep in the freezer. At least he’s an authentic artist. His tastes are a little prosaic to me, but he hasn’t been manufactured by a—what I really rail against is those people who sing and their voices are very powerful, but all they seem to be saying is, “Get a load of my voice.” There’s no genuine emotional communication. Whether it’s people with powerful voices like Eva Cassidy or Roberta Flack or people with less range like Frank Sinatra—he didn’t have a wide range, but he told you a story. Those are real artists because they add to the sum total of human happiness. There’s a sense of a real life there, with all the imperfections. Chris De Burgh will never have to worry about being compared to Frank Sinatra. AVC: And yet, the song reached No. 3 on the Billboard chart here and was No. 1 in Belgium, Canada, Ireland, Norway, and South Africa, in addition to the U.K.
SC: You know what? I’m kind of jealous of the U.S. for it having not been No. 1. How about that? Musically, I think we’re pretty equal in terms of good music, but there’s 300 million of you and 60 million of us, so I think on balance we may be ahead per capita.